I don’t think seeing moose ever gets old. 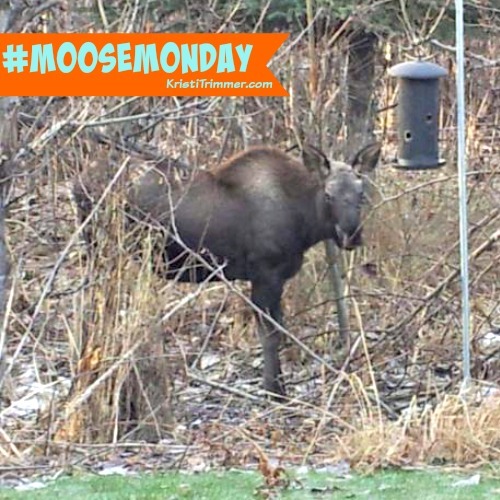 This baby moose was hanging out in a friend’s backyard where they took this shot. Little cutie, right? He was born this season so is looking at experiencing his first winter too. Boy, do I feel you little guy! Their tall legs are designed so they can easily step through the tall snow fields. I’ve seen these guys up close – their legs are crazy long! Well, Happy Moose Monday my friends and enjoy this pic of a baby moose in the backyard. I wish I could see moose in our backyard!! All we have are squirrels!! I love the Moose Scarf! !